Australian melodic rockers White Widdow were formed in 2008 and released their self titled debut album in November 2010 to great acclaim. Its a surprise then to see their second album being released towards the end of September 2011 - these days a 10 month gap between albums is almost unheard of with bands typically spending well over a year touring in support of the album before startign work on the next one. 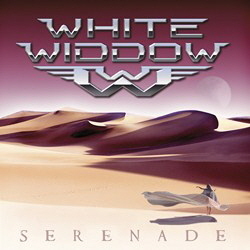 For those of you who havent heard White Widdow before, the one line summary is that they have a very 1980's melodic rock sound, with plenty of catchy choruses. Comments on a few of the songs..
"Do you remember" sounds to be strongly influenced by Def Leppard, particularly the Hysteria album - there are parts of the music in this song that sound like they'd be perfectly at home on the Hysteria album. "Reckless nights" is probably my favourite track on the album. Its got big choruses, a solid drum beat, nice guitar solo, but most important its just a great tune that you can imagine listening to on the radio on a hot sunny day. "Patiently" is a ballad with some nice guitar work and a slower pace than much of the album. The keyboards are just right to give the song a lift without stealing the limelight. There are some great songs on this album. If you like 80's style melodic rock then this is an album you need to own. European fans can catch White Widdow on their European tour in October, which includes an appearance at the UK's premier event for Melodic rock bands - Firefest.